Five years ago, FedEx delivered my Mezzo Violin (A440). Each of the following years I have entered comments to Violinist.com on the 20th of May. Nearly every day I read the comments of a frustrated a v.com reader trying to find a really good student violin in the $1500 price range. And in the back of my head, a little voice is screaming tell this person to investigate one of Bob Spear's imported mezzos. But by writing every time I am sure that it would sound as if I was commercially motivated. I am just one of Bob's satisfied customers. There are several reasons that these instruments are different. First is that Bob has refined a design from the inventive work done by members of the Catgut Acoustical Society in the last half of the 20th century. The result is an instrument that has a main body that has dimensions increased 5% from the Grand Pattern Stradivarius. 21St century woods react differently from 17th century woods therefore the need for the size change. Design parameters copied from the great old instruments are frequencies of acoustical resonances, not measurements of a caliper. As for playing, mezzos project better than an equivalent high grade14” violin and speak well in the full range of the instrument. But, of course due to resonances and impedances, as in all violins, each note has a different db level. Yet the sound is that of a true violin. Instruments that Bob contracts from the Chinese violin factory are required to meet the specifications of his mezzo drawings, including graduations, and quality as well as many other parameters. Even the varnish is required to be thin so as not to impede resonances of the instrument. (This is in contrast to wholesalers who order a quantity of violins from a factory without defining any specifications, just that they have bright shiny varnish and look good to sell quickly.) Currently Chinese makers have the ability to supply everything from vso's to some really great instruments. In the past year, I have read discussions in v.com where violin players have removed the tail piece fine tuner/s and installed instead a geared peg for the E string for an improvement in tone quality. All strings then are attached to the tail piece. Therefore I invested in a set of Wittner fine tune pegs. There are other fine tuning pegs are on the market that you should study to find which are most appropriate for your own use. The result: is, like all other adjustments to a violin, just another small but important increment in the quest for a better sound. And tuning all strings becomes much easier and more precise due to the gear multiplication. Another subject; problems of playing. We have moved to a NE Dallas suburb and finding a church where I can play as a DIY offering nearly every Sunday is turning into an extended quest. I enjoy playing, but want something that requires me to practice. Therefore the fiddle is in its case and the bows are hanging on the wall to save the hair. I now understand the problems of v.commers who want to play in church but have not found a way to fit in. Discussion: Why is the maximum size of violins limited to traditional 4/4? 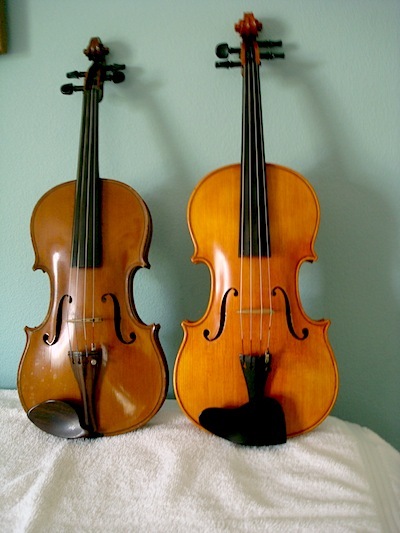 Maybe I'm missing something, but why would a beginner want a bigger than full size violin? It's certainly not the case with me, but a large person might be better fitted with a mezzo? Anyway, it's an interesting bit of history, the story of Carleen Hutchins and her experiments with various-size violins and stringed instruments. It isn't that much bigger. It is shallower in the ribs. Less than 1"longer. Even Gibson going from a 16" to a 17" guitar body is a bigger change. The Mezzo that I heard up close sounded great. It is an interesting idea. In some ways it is a no-brainer. Make the plates larger and they are going to speak. Violas are always richer sounding than violins. By making the ribs shallower in the Mezzo the Helmholtz resonance is kept where it belongs but the bigger plates give more projection. Pretty simple really.